American AUTOMB (ah-tomb) formed in 2018. Automb is female-fronted black metal band that blends death metal elements seamlessly with classic black metal and atmospheric tones. 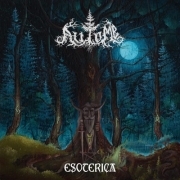 Debut album ‘Esoterica’ features Serge Streltsov from NECROPHAGIA, Scott Fuller from MORBID ANGEL and beautiful lady-vocalist Danielle Evans. It features bone-crushing blast beats, soul wrenching growls, punishing rhythms, and epic atmospheric leads. Dedicated to Frank «Killjoy» Pucci (R.I.P.) from Necrophagia. For fans of BEHEMOTH, WATAIN, EMPEROR, DRUDKH, VADER, MORBID ANGEL, MAYHEM. Artwork by Vojtech Doubek from Moonroot Art.